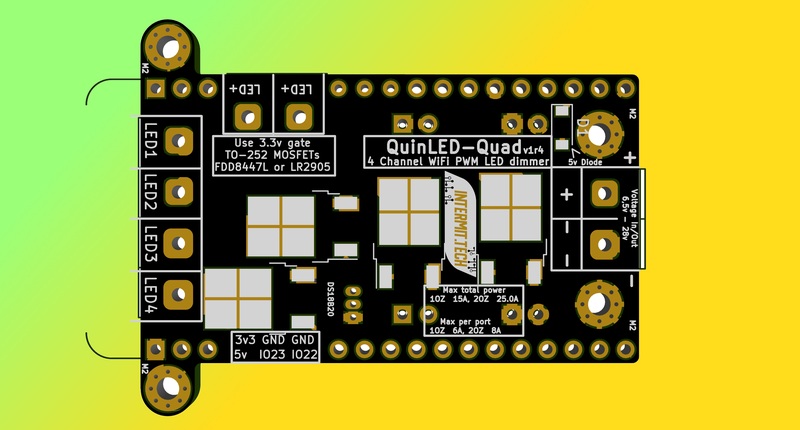 QuinLED-Quad is a 4 channel WiFi PWM dimmer. 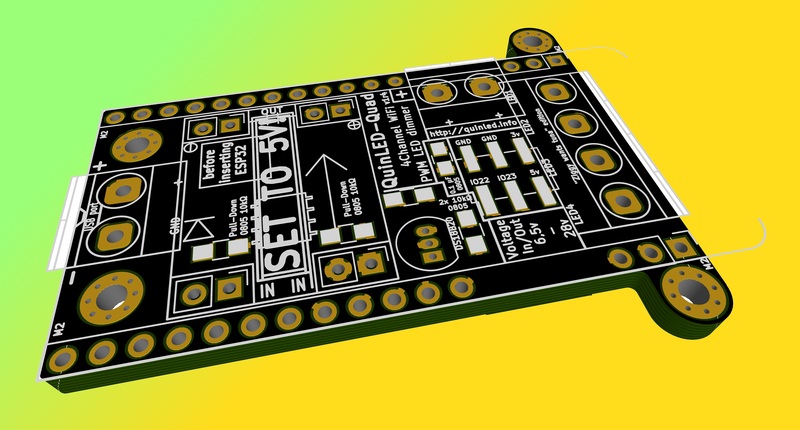 It’s design goal was keeping the footprint/size as small as possible while still enabling 4 high-power channels so you can run 4 independant LED strips or use it to power a RGBW strip. It also has several GPIO and power pins exposed to hook up switches, sensors or anything else you would like. This board has a single set of input terminals to provide input power. For output there are 4 minus side terminals and 2 plus side terminals. Dimming happens on the 4 minus/negative channels. Combining a minus and plus side terminal gives you one channel. That way you can create 4 channels total. If you are using the channels as 4 independent channels for 4 white LED strips for instance, you will need to put 2 positive connections into each positive terminal. If you are using an RGB(W) strip, you only need one connection in one terminal. Both terminals are connected to the same shared plane, if you cannot get 2 wires into one terminal an external connection block can be used. 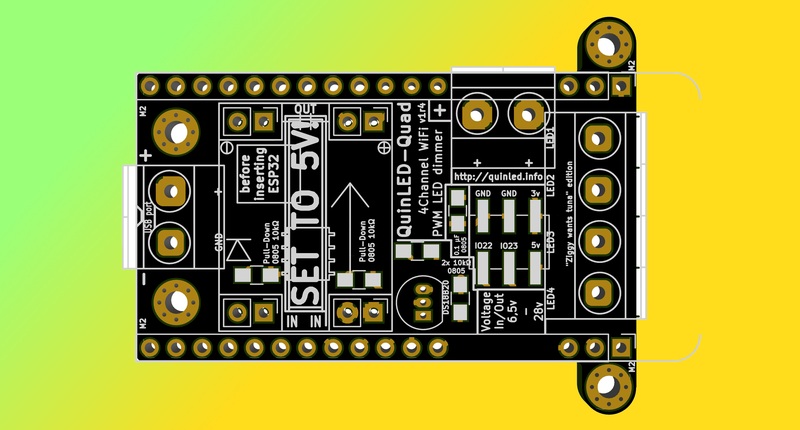 You can find common wiring diagrams for the QuinLED-Quad over here. 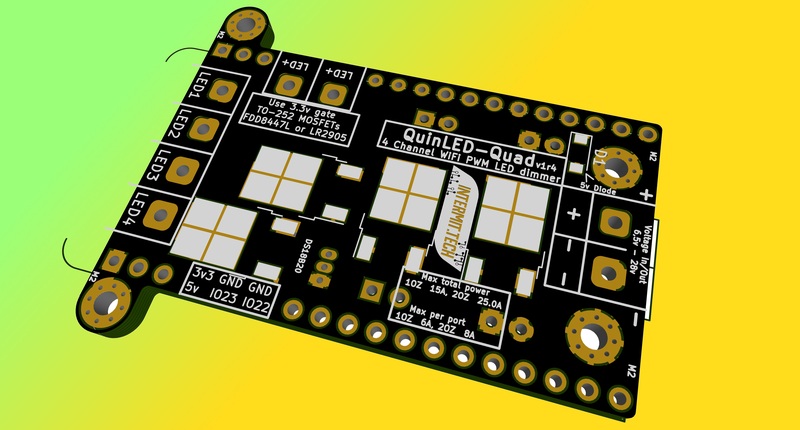 The QuinLED-Quad uses an auto-scaling DC-DC converter for it’s on-board electronics. 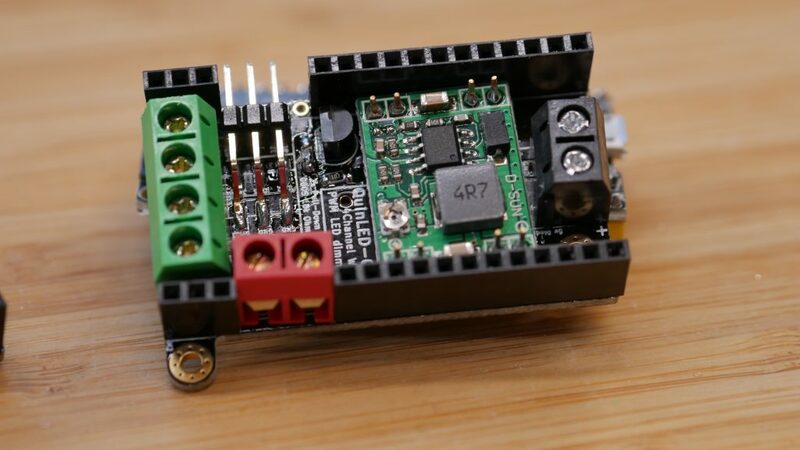 Currently the on-board voltage converter can officially accept a maximum of 28v. In the future I will be running tests beyond 28v. Since we aren’t using the converter anywhere near the limit it probably can be used up to 36v but more test are required! It requires a minimum of 6.5v to operate correctly. *If you need to use a higher voltage, take a look at the QuinLED-Deca, it’s suited for up to 50v!